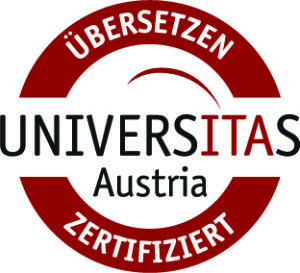 Even after having earned a specialized degree, the members of the Austrian Interpreters and Translators Association Universitas must undergo a strict testing procedure in order to become listed as certified translators or interpreters. To make this additional qualification more visible, the professional association Universitas created the certification label. In other words: Dear customers, I remain at your service with highly professional services, but now I can officially claim to be “certified”. Many thanks to Universitas for their support!